First, there was Apple Carplay. Then Google leaked details of its own efforts to embed the Android operating system in your next car. Now, at the Build 2014 developers conference in San Francisco, Microsoft has given the public its first look at Windows in the Car, its own competing car infotainment display that dovetails with the Windows Phone 8 operating system. Windows in the Car looks a lot like what you’d expect from a Windows 8-based infotainment UI. A Start screen gives you the most important information you need, such as key road warnings and your favorite programs. 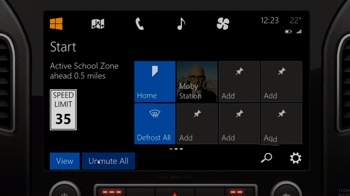 You can pin favorite tiles to the Start screen too, so your favorite in-car apps like Pandora will always be at easy reach. Windows in the Car is powered on the MirrorLink standard, which works with all mobile phone operating systems. That’s a huge benefit here – I’d hate to build iOS into my car only to switch to an Android phone later, especially given how quickly mobile operating systems evolve. That said, designing a car infotainment system around the unpopular Windows 8 operating system smells like a clear dud. Looking at the video, there’s nothing especially intuitive about its operation – an important feature for a car UI. Who wants to learn a new, unfamiliar interface while sitting behind the wheel? And if you don’t like Windows 8 on your computer or your phone, why would you ever want it in your car? Currently, automakers Volkswagen, Honda and Toyota have committed to support MirrorLink (and Windows in the Car). Aftermarket car audio manufacturers Alpine and Pioneer will also support the technology in certain units. A launch date for Windows in the Car has not been set, though it will likely be well into the future. To learn more about Microsoft’s newly proposed Windows in the Car mobile experience, check out the promotional video below. You may also want to read our rundown of the top entertainment, communications, and safety tech currently available in new cars today.